sponsored this year by law firm in Exeter. 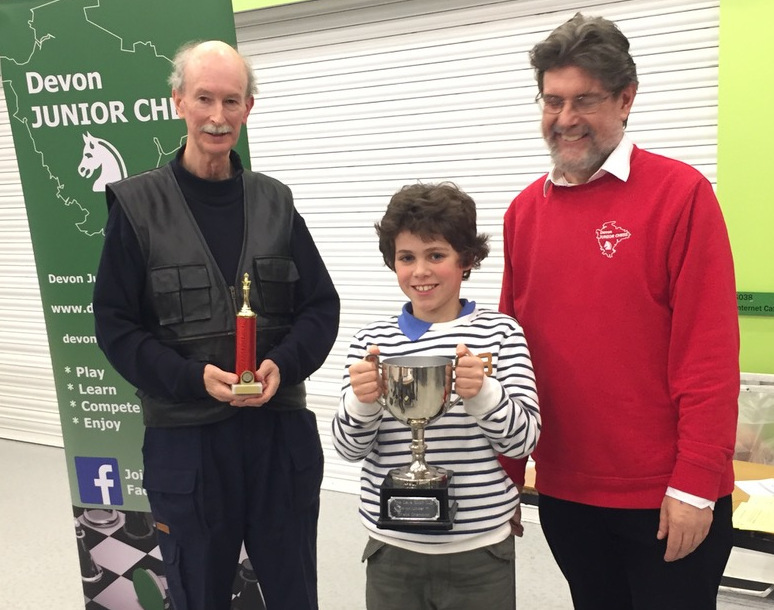 The Devon Junior Chess Championships concluded yesterday. For the first time in a long while we held the event in Exeter, in the hope of being more accessible to players around the county. We would like to thank very much West Exe School for hosting the event in their splendid building, and of course Ashford's for their support. 50 young chess players came to contest the places from schools across Devon. Four separate individual competitions were held -- under 9s, under 11s, under 15s and under 18s. For some, it was their first tournament, while others have been playing for perhaps a decade already. Trophies were awarded for the top three in each division, as well as Best Girl and extra age prizes (best under-8 in the U9s, for example). Three of the sections had outright winners, but there was a remarkable three-way tie for first place in the U15s, featuring two players who were also the U14 age group winners. The competition includes the Schools Team Competition, which this year was won by Exeter Junior School. Each round was fiercely and sportingly contested, and the standard of the best games was a great credit to the skill and concentration of the players. I would like to add a note of thanks to all who helped make the event run smoothly, a real team effort. PLAY will start at 9.30am. The day will finish at about 5.15pm after the prize giving; this will be as soon as possible after the last round finishes. Please arrive in good time. TIME CONTROL is 25 minutes per player per game with 10s increment per move. Everyone plays in all 6 rounds (except for byes). DEVON SCHOOLS’ U11 & U9 TEAM CHAMPIONSHIPS: Team lists of 5 players from the same school to be handed in by the start of round 2. The scores of the 5 players will be totalled at the end to find the school champions in the U11 and U9 sections. COUNTY TEAM SELECTION: Performances will be used to help select the Devon Junior Chess Teams playing against local counties in January. SUPERVISION: We will be responsible for players' safety and behaviour only in the playing rooms. Please arrange for the players to be supervised by a parent, carer or other adult in the rest area and especially outside. BRING something to do between rounds. PRIZES: Trophies will be awarded to the first three places in each section. Other prizes may be awarded according to the size of the entry. FACILITIES: We are hoping to arrange a refreshment stall offering hot and cold drinks and snacks. There will be a CHESS SHOP selling books, sets and other items. DIRECTIONS: Approaching Exeter by M5 J31 or A38/A380, use A30 heading towards Okehampton/West to skirt around the South of Exeter. You will reach A377 signposted Exeter/Crediton (Alphington Junction); head towards town centre/Marsh Barton at the roundabout along Alphington Road. Turn left on Cowick Road opposite Sainsbury's/Marsh Barton Industrial Estate (signposted Exwick/Alphington/Dawlish (A379) Superstore). Keep left at the junction (you will see the school ahead) and drive to the other end of the school; turn right into Hatherleigh Road. I hope then there will be familiar signs saying 'CHESS' to lead you to the rest room.